Saturday we loaded the kids & associated gear & headed out to Richmond for a bike ride along the dykes with friends. We decided to take the Canada Line to Richmond, which takes us quite close to our friends' place. After we met up, we all biked past the Richmond Olympic Oval, over to the riverfront to continue along the West Dyke Trail to Garry Point Park, where we had fish & chips for dinner. 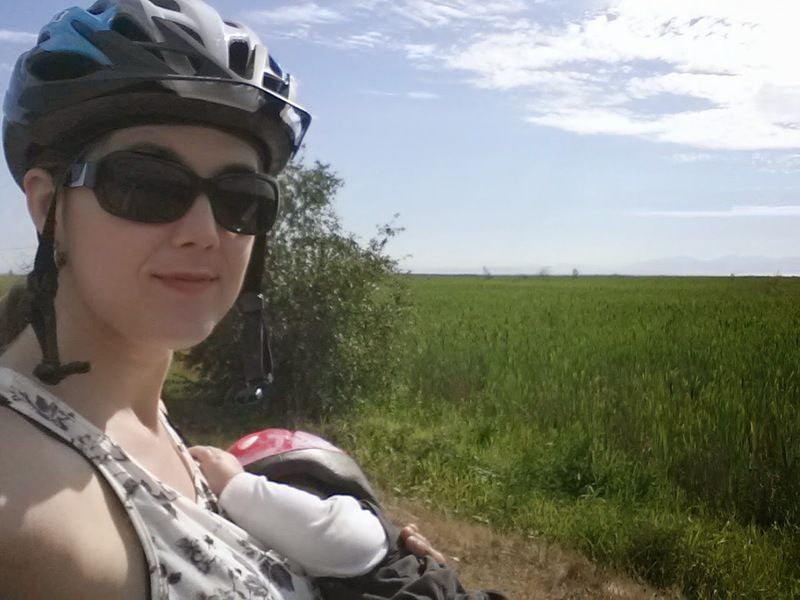 The mixed-use West Dyke Trail wasn't terribly busy on such a warm day, so during our brief stops along the way--to breastfeed the baby & water the preschoolers--we had the place to ourselves. It's a beautiful place to go: expansive views across the Sturgeon Banks estuary to the blue Coastal Mountains in the distance & lots of 'rest stops' with benches to enjoy the view dotting the route. If you haven't been to Garry Point, it's a great park for kite flyers, with a usually windy open area just for the purpose. There's a small beach, a Pajo's fish & chips stand & a (pricey) ice cream place, a few picnic tables (not quite as many as there's demand for) as well as washrooms. It's just a block or two away from the touristy boardwalk area of Steveston. From the Canada Line to the dyke to Garry Point & back again (we took the road to the Skytrain on our way home) was about 20km. If that seems like a long way to bike, it was very doable over the four or five hours we did it, including snack breaks, dinner & a little time on the beach. I rode the Yuba Mundo with both kids on it, Oliver rode his cyclocross & our friend rode her cruiser with her almost-five-year-old on a trailabike. It was a lovely day, really, with only some minor hiccups. Getting our Yuba Mundo into the elevators at all the stations we used (City Hall, Lansdowne, then Brighouse & King Edward) is possible, but requires a lot of finessing with two child seats on the back (this extends the length a couple inches or so) & the wide Bread Basket on the front. The only place we couldn't make it work was King Edward station, where the elevators are the same size, but you enter one door & exit another, so it's not possible get out once you're in. We had to unload the kids & bring the bike up the escalator. Next time we won't use King Edward station. 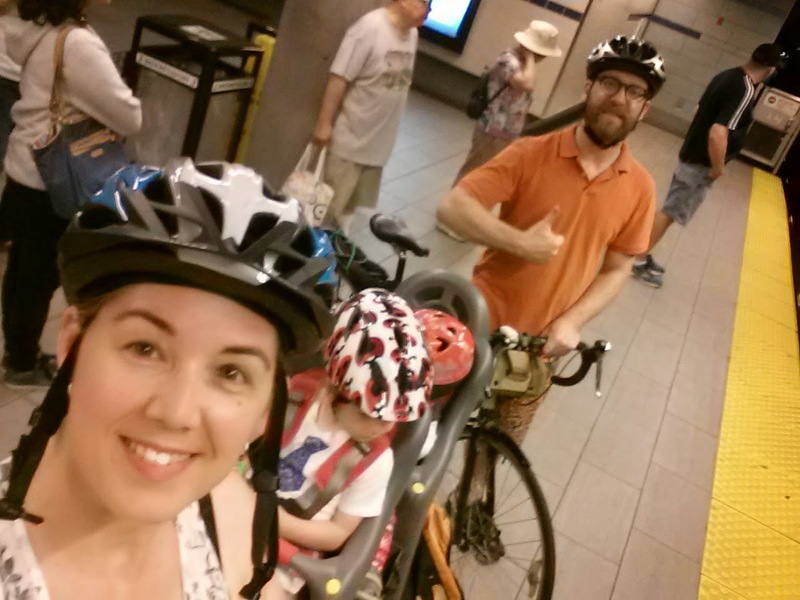 Over the summer, I hope to try the Yuba in as many skytrain station elevators as possible. I'll figure out a way to publish that info so other cargo bike riders can access it--maybe reviews on Google or something. If you've been to other stations with a longtail cargo bike, how did you manage the elevators? Do other stations have the double-door style elevators? Please let me know in the comments! I am very proud of you to read this story. There so few people who take care of our planet by leaving their car as much as possible parked !